We’d love your help. Let us know what’s wrong with this preview of The Human Spark by Jerome Kagan. As infants we are rife with potential. For a short time, we have before us a seemingly infinite number of developmental paths. Soon, however, we become limited to certain paths as we grow into unique products of our genetics and experience. But what factors account for the variation—in skills, personalities, values—that results? How do experiences shape what we bring into As infants we are rife with potential. For a short time, we have before us a seemingly infinite number of developmental paths. Soon, however, we become limited to certain paths as we grow into unique products of our genetics and experience. But what factors account for the variation—in skills, personalities, values—that results? How do experiences shape what we bring into the world? 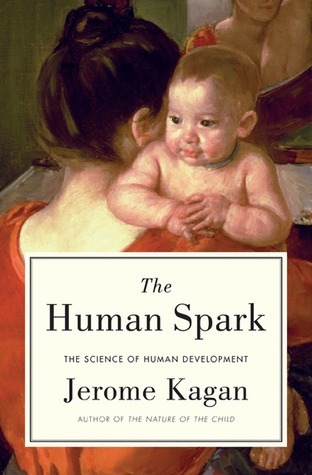 In The Human Spark, pioneering psychologist Jerome Kagan offers an unflinching examination of personal, moral, and cultural development that solidifies his place as one of the most influential psychologists of the past century. In this definitive analysis of the factors that shape the human mind, Kagan explores the tension between biology and the environment. He reviews major advances in the science of development over the past three decades and offers pointed critiques and new syntheses. In so doing, Kagan calls out the shortcomings of the modern fad for neuroscience, shows why theories of so-called attachment parenting are based on a misinterpretation of research, and questions the field's reflexive tendency to pathologize the behavior of the young. Most importantly, he reminds us that a life, however influenced by biology and upbringing, is still a tapestry to be woven, not an outcome to be endured. A profound exploration of what is universal and what is individual in human development, The Human Spark is the result of a scientist's lifelong quest to discover how we become who we are. Whether the reader is a first-time parent wondering what influence she, her genes, and the wider world will have on her child; an educator seeking insight into the development of her students; or simply a curious soul seeking self-knowledge, Kagan makes an expert and companionable guide. To ask other readers questions about The Human Spark, please sign up. One thing I appreciated was Kagan acknowledges the power of our ideas and belief on our behavior. The fact that ones worldview has sway on how they live, is something so incredibly obvious, but from most science/pyschological books I've come across, one wouldn't think so. Many today act as if it is all a neat little mix of genes and environment that accounts for who we are. But yeah, the author does an excellent job showing how complex everything is, bringing things to light that so many other a One thing I appreciated was Kagan acknowledges the power of our ideas and belief on our behavior. The fact that ones worldview has sway on how they live, is something so incredibly obvious, but from most science/pyschological books I've come across, one wouldn't think so. Many today act as if it is all a neat little mix of genes and environment that accounts for who we are. But yeah, the author does an excellent job showing how complex everything is, bringing things to light that so many other author's completely ignore. I liked how Kagan exposed many problems with frequently sighted psychological studies, demonstrating examples of how much ones situation matters. He showed how slight tweaks in the environment where a study is preformed can change the outcome. He showed the folly of putting to much credence in studies that rely solely upon what people write in response to survey questions. For example, people lie consciously and unintentionally, and subtle changes in the wording of a question can result in utterly contrary answers. He made some wonderful points countering a movement that tries to claim all social misbehavior is the result of neurological malfunctions. For example some like David Eaglemen give me the impression that they believe crime is merely a result of a sick brain. That people are not personally responsible, for they couldn't have done otherwise (They still may need to be locked up). To support this they show examples of those who were fine before something went wrong in their brain, later wigged out and did tons of horrible things due to a tumor or brain disease. Kagan points out that multitudes with the same brain ailment don't commit crimes and tons of folks without the brain disease commit crimes. So indeed, things are not as conclusive as these over-eager to change the justice system scientist want to admit. An elder statesman of psychology here gathers his thoughts on not just human development, but studies of human development and indeed the field of psychology itself. He makes a strong case for temperament predicting personality first and foremost, with overall context (especially family socioeconomic status) coming in second. Particular parenting practices, like the emphasis on a 'secure attachment,' seem to him to have little evidence behind them, and instead are simply a product of their era. An elder statesman of psychology here gathers his thoughts on not just human development, but studies of human development and indeed the field of psychology itself. He makes a strong case for temperament predicting personality first and foremost, with overall context (especially family socioeconomic status) coming in second. For instance in treating mental illness Kagan describes how "patients improve in psychotherapy when...the patient and therapist agree on the cause of the patient's distress...the patient and therapist share the same belief about the best therapeutic regimen...and, finally, patients respect and like their therapist, assume that he or she sincerely cares about them, and most important, believe that the therapeutic regimen will be effective." Given that additional studies of therapeutic interventions tend to show less dramatic benefits than initial studies, Kagan says "if and when research reveals that one of these therapies, or any other novel therapy, is less effective than promised, or not effective with every patient, both therapist and patient will lose faith in the power of the regimen and the mutual commitment required for cure will be diluted." (252-3) So a sort of self-fulfilling prophecy. An intriguingly contrarian work of (mostly social) psychology. Whether you agree with his views or not (I found myself agreeing with--or at least considering--a number of them and merely taking note of others), having such a strong and reasoned voice of skepticism examining fundamental tenants of psychology should be welcome in a science. And there were many great points here that were not contrarian. I thoroughly enjoyed it. "If a child's semantic networks and schemata for nature are linked to the network for female, we might speculate that an intense curiosity about the natural world reflects, in part, a deep curiosity about women who, in the average child's mind, are more mysterious than men. Mothers and wives are far more affectionate, trusting, and self-sacrificing than fathers and men, and they hide their mysterious sexuality behind a mound of hair."